I'm teaching a section of NT and Early Christianity this semester and, as usual, I am having students read the Gospel of Mark and write short summaries of each of the 16 chapters. As sometimes happens (given the formatting of modern Bibles) I had a student who ended his summary at Mark 16:8, omitting reference to vv. 9-20. I commented on this in a grading note, and he and I had a discussion on this after class. The reason he said that he had not included comments on vv. 9-20 was that it was not in his Bible. He then showed me his The Jesus Bible, NIV Edition (Zondervan, 2016). This Bible is apparently one promoted in the para-church "Passion" movement and endorsed by a group of evangelical celebrity ministers, including John Piper, Max Lucado, and Ravi Zacharias (see this site). I was not familiar with this edition, so I took a look and at my student's Bible (and he allowed me to take a few pictures--see below). Sure enough, I could understand his confusion. The layout certainly would lead the reader to believe that Mark ends at Mark 16:8. Not only is there a thick black line that underscores the space after Mark 16:8 but a bracketed comment explains: "[The earliest manuscripts and some other ancient witnesses do not have vv. 9-20.]" After another broad spacing, it includes vv. 9-20 but in italic. What it more, there is also a footnote after Mark 16:8 which includes the so-called "shorter ending," also in italic. 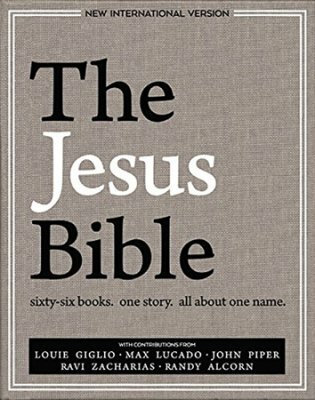 This footnote introduces the shorter ending with these words: "Some manuscripts have the following ending between verses 8 and 9, and one manuscript has it after verse 8 (omitting verses 9-20):"
The layout and the notes in the Jesus Bible, NIV Edition for the ending of Mark are deceptive. Mark 16:9-20 is missing in only two extant Greek manuscripts. It is clearly attested in patristic witnesses from the second century (by Irenaeus and Justin Martyr, writing 200 years before the two uncials that omit these verses were even copied!). It is the reading of the vast majority of extant Greek NT manuscripts and has been included in the Protestant Bibles since the printing began in the post-Reformation era. The notes also fails to tell the reader that the "shorter ending" along with vv. 9-20 appears in only six Greek NT manuscripts (and one lectionary), the earliest of which dates only to the VI-VII century! It is clearly a late fabrication with no standing to be considered on par alongside vv. 9-20. The one witness it mentions that includes the shorter ending and excludes vv. 9-20 is the Old Latin codex k which has a number of suspect readings in Mark 16 that cast grave doubts as to its reliability. For more details on the text of Mark's ending, see my recent article "The Ending of Mark as a Canonical Crisis." It still amazes me that evangelicals are so easily abandoning the traditional ending of Mark on the basis of so little compelling evidence. Sadly enough, through its editing of Mark 16:9-20, the "Jesus Bible" casts doubt on one of the four canonical Gospel witnesses to the resurrection appearances of Christ. Pastor Riddle, I believe the reason for the acceptance of the MCT ending and thus the rejection of the TR ending,is due to a tyranny of Greek experts. If you would list the seventeen words that Elliot rejects in English most people would laugh at his objections. Also, if someone wants to check critical notes in a modern translation I would suggest a Holman NKJV to get a more accurate idea of what is missing in manuscripts as it is far less biased in favor of Aleph and B.